The last time I posted Sauteed mushrooms and onions, it was a rich and unctuous burger-topper sauteed in butter that I learned from my friend Marianne – the wife of one male and mother of two more, and so an expert in crowd-pleasing, no-holds-barred burger toppers and other such make-happy-the-hungry-horde type stuff. But now it’s January, the birth month of good intentions (and the trail head of the road to hell, but never mind) and Marianne and I are looking at ourselves and deciding it is time to try slimmer versions of our favorite meals. We’ve been getting together on Sundays and making good, healthy,veggie, low-whatever refrigerator items for the week. 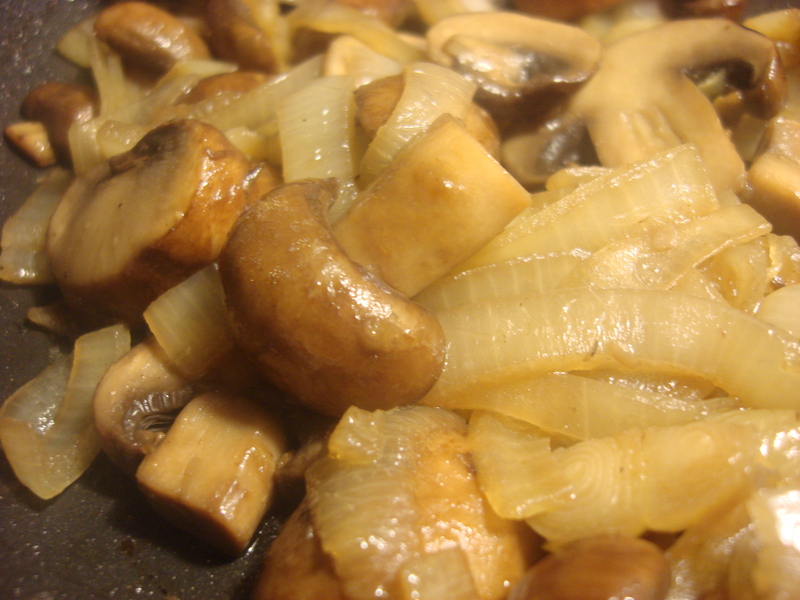 Thus, this new take on sauteed onions and mushrooms. No dairy (Susu, are you listening?) and yet still unctuous and savory (mushrooms tend to do that). Try it on black bean burgers with quinoa or without and feel truly virtuous! Heat the olive oil at medium high in a large skillet until loose and fragrant. Add onions and stir to coat. 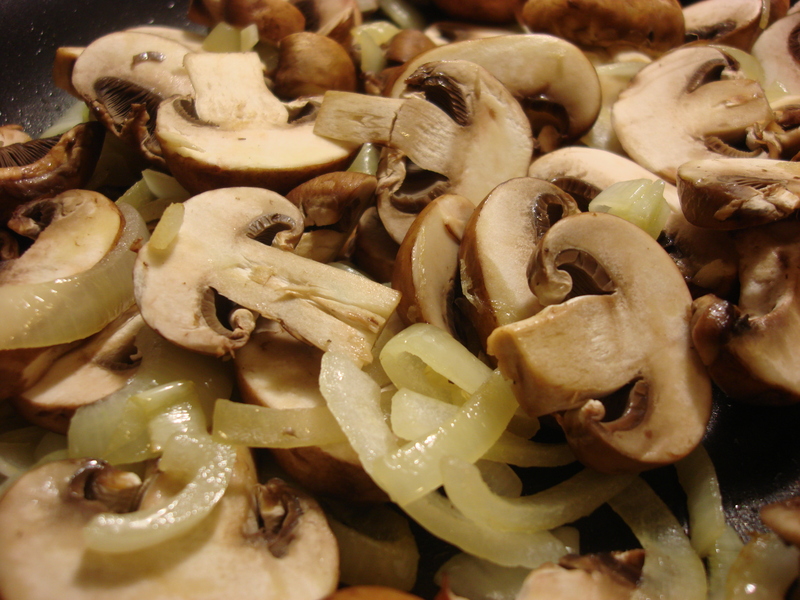 Add mushrooms and stir to coat. Sprinkle with adobo seasoning, lower heat to medium low and cook, stirring occasionally, for about ten minutes, until onions are quite wilted and mushrooms are darkened and soft. That’s three for the steak. Do you do take away? Fabulous and I´m with MD – lovely with a juicy steak! bung ’em on top of one of your many birds…..
Sure you were…too bad you’ve got all those birds to go through first…I cry fowl!